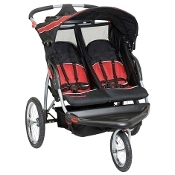 Our Double Jogging Stroller with locking front swivel wheel is made for two children up to 50 lbs each. It has multi position reclining seats and 5 point harness for safety. Convenient parent tray, two cup holders, shade canopy and underseat storage. Colors and styles may vary.